To get in contact with us please call any time, 1-778-692-5577. You can also reach us by email at edidixon@telus.net. Or if you are having issues or have concerns of a technical nature you can direct them to our webmistress and IT director at yaeldcohen@gmail.com. Please check us out and like us on Facebook. The link is at the bottom of the page! Are you looking to take up to 14 of your closest friends on a wine tour? Or perhaps you are a wedding party needing transportation to and from your reception? Or a group needing to go to a corporate function, concert, skiing, or the airport? Our bus can transport a maximum of 14 passengers and is fully wheel chair accessible with a ramp. We operate 24/7. Whenever and wherever you need us we can help facilitate your group transportation needs. Call 778-692-5577 to speak to our friendly and knowledgeable staff. You choose 4 wineries from the following list: The Chase, 50th Parallel Estate Winery, Intrigue Wines, Graymonk Estate Winery*, Ex Nihilo Vineyards*, Arrowleaf Cellars, & Blind Tiger Vineyards. We have a fully licensed transit bus, that can accept a maximum of 14 seated passengers. 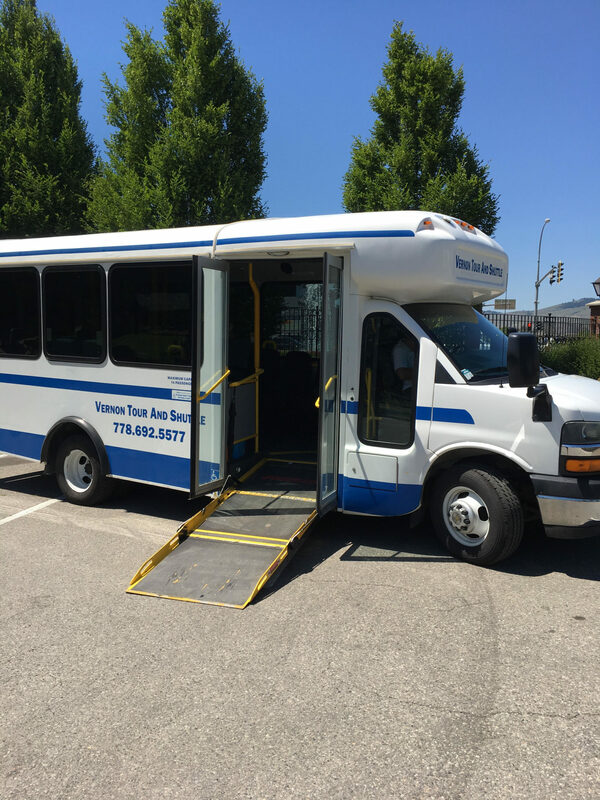 Our bus is configurable for the addition of wheelchairs and in wheelchair configuration seats 12 passengers and 1 wheelchair, or 10 passengers and 2 wheelchairs. We are fully equipped with a foldout wheelchair ramp on board. If you need something special, Weddings, staff parties or special events, we can give you a custom quote upon request. 24 hour notice is strongly encouraged to ensure availability.